Quantity 3,000,000 Size 45 x 27 mm. 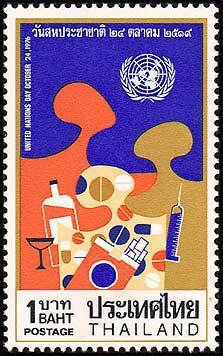 Aid from United Nations Organizations for drug addicts; various tools of addiction, along with other kinds of addiction such as alcohol and cigarettes. Designer: The Post & Telegraph Department (Mr. Prakai Sangamuang). Printer The Government Printing Bureau, Ministry of Finance, Japan. Printing Process: Photogravaure. Sheet Composition: 50 stamps.